Thanks so much Nigel, this is amazing and perfect for purpose!! I also appreciate that it is a difficult ask given that you've not seen the material in person, so I am especially thankful! Many thanks for a fabulous, thorough job! On behalf of all QM I would like to thank you both for your excellent reports. You have gone above and beyond expectations and provided very valuable documentation on these important specimens. Thanks for all your hard work scanning the specimen and on the paper. It’s fantastic to see this specimen published! I’ve just seen the specimen - it looks wonderful!! Thank you so much for doing the work on it, and for the generous pricing you gave me. It was an absolute delight to meet you. You are a wonderful teacher and mentor! The course gave me a new found confidence on working with the fluid filled specimens. Thank you for your quick response, your advice is greatly appreciated and will help us figure out the best way forward. Many thanks. I can't thank you enough for Saturday, I think it went amazingly well. I came to try to talk you but you were so busy! We have had some lovely feedback from visitors and our volunteers. 'THE HORSE LOOOKS AMAZING! A massive thanks to you both'. 'The tusk looks absolutely stunning; a great demonstration of your collective skills. I think the internal mount is a good idea as it is so unobtrusive and the way it balances looks interesting... a great job on the painting too'. 'So once again, a HUGE THANKS for your amazing work on this specimen. You're the best--really. And hopefully we can get you to prepare some more fossils'. ‘One of our giant deer skulls has returned with some fantastic conservation and a new mount by @MrIchthyosaurus’. - 'Huge thanks Nigel for all your hard work and support for our exhibition. It has been wonderful working with you again and the mount is absolutely fantastic – really brings the fossil ‘alive’. Its so amazing to be able to see the fossil as a 3D skeleton, it’s a stunning mount!.' Isla, Bristol Museum and Art Gallery. - 'Just a quick email to say a massive THANK YOU! from all of Team Pliosaur for all your hard work and commitment to the Pliosaurus! exhibition. The mount looks fantastic and now we have been open to the public for a few days it’s been lovely to see the public admire and gasp in awe at the beast! Thank you so much for all your expertise and skill in creating such a stunning mount for our beautiful fossil – we’re thrilled.' Debs, Bristol Museum and Art Gallery. - I have to say your work on Doris is a real triumph. The way the 3d printed parts are blended into the rest of the specimen is amazing. Steve, ThinkSee3D, Oxfordshire. - 'Firstly thank you so much for all your work with our Pliosaur fossil, it does really look amazing in the space, I don’t think we quite imagined we would be able to present it in the way that we have so we are all really pleased'. Becky, Bristol Museum and Art Gallery. 'The rhino horn replica arrived - It looks SUPER!!! Really lovely, thank you so much. Claire, Buxton Museum and Art Gallery. Laura: ‘It has been a very good experience for me, a bit confusing at the beginning, but when everything started to make sense, it got much better. I actually got a lot from it, and I will hopefully be able to use the new skills I have acquired also here at the Zoological museum. The most important thing, probably, is that I have learned not to be “afraid to touch” old nice jars, with the fear of making more damage than help – now at least I have a better idea of how to handle them’. Karen: ‘Thank you very much for the photos, and for the course. I have learned a lot… Like Laura, the most important thing, probably, is that I have learned not to be “afraid to touch” old nice jars, with the fear of making more damage than help – now at least I have a better idea of how to handle them’. Kel: ‘A great course indeed! Fun and very educational at the same time. I will cherish the photos but I think the most valuable asset you gave everyone was the confidence to handle the materials, and to learn from what we’ve done correctly and wrongly. Hopefully now, this summer’s preservation duties will be far less daunting. Thank you’. 'The museums team are very much looking forward to having your support - you are much admired for your knowledge and skill'. Thalia, Royal College of Surgeons, London. 'The [replica] teeth were amazing, thank you so much. They went down a treat with our visitors and really added to the day's event'. Debs, Bristol Museum and art Gallery. Kate: 'Many thanks Simon for another fabulous course. I think I may have found my calling in conservation! It now remains for me to convince the people of Ireland to have their taxidermy conserved instead of skipped! Jon, The Lapworth Museum of Geology, University of Birmingham. Katy, Scarborough Museum and Art Gallery. Kate, Hong Kong: 'Dear Mr. Moore, Thank you very much! Everything is perfect! I had a wonderful time from your course and definitely learnt a lot from you! I am very interested in taking more of your courses, so please let me know your next course when it comes up so I can book my journey in advance! Thank you again! All the best! Best regards'. Ruth, Cambridge, UK: 'It was a fantastic course and I feel much more confident tackling the conservation of our display specimens now'. '...once again, a HUGE THANKS for your amazing work on this specimen. You're the best--really. And hopefully we can get you to prepare some more fossils. Dr Stephen Brusatte, School of GeoSciences, University of Edinburgh. '...thanks very much doing for an excellent job and delivering it so quickly for us. We're very happy with the conservation work and also the very nice and unobtrusive stand you've made. Robin Jackson, Senior Project Manager, Worcestershire Archaeology. 'Many thanks for your great work on this project and hope to see you again soon'. Adam Smith, Nottingham Natural History Museum. Debs Hutchison, Bristol City Museum. ‘Thank you very much for the documents and photos; it was a great course and we learned a lot of skills. I also want to thank you for the patience you took for all of us’. John. On a large woolly mammoth skull recently conserved and prepared for display: ‘...your mammoth skull from La Cotte de St Brelade looked magnificent in the exhibition at Jersey Museum’. Sarah Finney, Sedgwick Museum of Earth Sciences, University of Cambridge. @MatthewPope (Dr Matt Pope), Ice Age Island project. Glenys Wass, Collections Manager, Peterborough Museum. Liesl Barber, Conservator, Midlands Hardwick Consultancy Office. The Countess of Caledon, Ireland. Justin Wilkins, In-situ Bonebed Curator, The Mammoth Site of Hot Springs, South Dakota, USA. Kevin O'Donnell, Cardigan Castle, Ceredigion, Wales. ‘Just wanted to say that I really enjoyed the Moving Natural History Collections course - it will be really useful for the Saffron Walden Museum moves. So thanks to you and your team’. Sarah Kenyon, Natural Sciences Officer, Saffron Walden Museum. Olga Finch, Curator of Archaeology, Jersey Heritage. 'We're really delighted to have you working on this, it makes all the difference to see real enthusiasm for a project and the ideas/feedback raised so far are just what we hoped for'. Francoise Jackson, Collections Officer, Abingdon County Hall Museum, Oxfordshire. 'Many thanks for your reports and links to various funding possibilities; it was an extremely valuable experience from my point of view.... Once again, many thanks for your time and expertise'. Tonia, Almonry Heritage and Tourist Information Centre, Evesham. I really enjoyed the course, and I have already applied some of what I learnt at work. - I thoroughly enjoyed myself and learnt a huge amount. There has been a lot of interest in my workplace regarding some of the things learned. I foresee some changes ahead! - Many thanks for such a brilliant few days on the course. - Thanks very much, Simon. I did learn a lot and raring to put what I learnt into practice. - The course was fantastic and will prove very useful! Thanks again. - I enjoyed the course. A great learning experience. So much in so little time! Man-Yee Lui, Norfolk Museums and Archaeology Service. Emily Watts, House Steward, Knole. ‘Thank you again for the wonderful course and now for the certificate and photos’. ‘Many thanks for providing this useful information for our volunteers and just to let you know that the feedback from volunteers was extremely positive and enthusiastic about the training and they are all now very eager to start packing! Thanks again for such an informative training session’. Jane Harrison, the Lapworth Museum of Geology, University of Birmingham. Dave Naish, Education Manager, Bristol Zoo Gardens. 'Slightly daunted by the scale of tasks to do and the amount of time and specialist work it needs but your prioritising them certainly helps! Thanks for what I think is a very honest and practical report - just what we needed'. - 'Thank you so much, it was great to meet you and take part in the course'. Sophie, Colchester and Ipswich Museums. 'I really am so grateful to you for taking this on, and for doing such an expert job'. Mark Wormald, Pembroke College, Cambridge University. 'So, I’ve spent the week at the Horniman Museum. I have dozens of photos to look through and pages and pages of notes, so it’ll be a while before I have chance to write up everything that I’ve learned. The course itself was fantastic, and I learned so much that I fear my head may explode'. 'Thank you for the photos and thank you for the brilliant course. I learned a huge amount, but more importantly, feel more confident with my practical abilities. I will be leaving a detailed write up and a list of future recommendations for the Powell-Cotton Museum so they will still benefit from my training. .. and I have no doubt the museum will maintain contact and continue the relationship'. 'Thank you for your long and extremely helpful email about the whalebone arches! In addition to the materials you mention it has been rather good to read, because it reflects many of my own thoughts about the issue and likewise of Danish colleagues I have been talking to. Good to know from somebody with a lot of experience on the issue that there really is no magic solution to the problem'. Trine Sørensen, Conservator of natural history, Museum of Southern Jutland, Denmark. 'Thank you for your support and involvement in the Fossil Roadshow . It went even better than we could have hoped. I am still receiving messages of appreciation and thanks directed at those involved. We all believe very strongly in the promotion of this project/subject area and it is great from my point of view to have your support'. John Davies, Chief Curator, Norwich Castle Museum. 'Thank you for sending the report - it was fascinating, and it's very useful to have a record of the exact technique you used. I am more than satisfied with the work - the rhinos look fantastic'. Beth Wilkey, Collections Officer, The Powell-Cotton Museum, Quex Park, Kent. 'It was a pleasure to meet you and we are so pleased with the work that you have done on our rhino. We have posted the images and story on to our social media pages and our followers have shown a great deal of interest in the project'. Karen Botha, The Powell-Cotton Museum, Quex Park, Kent. Mr Nigel T. Monaghan, National Museum of Ireland. Dirk Neumann, The Bavarian State Collection of Zoology, Munich (ZSM). Abigail, Department of Pharmacology at the University of Cambridge, regarding moulding and casting a Merino sheep skull and mandible for research. Tony Gee, Senior Project Manager, Davis Langdon, An AECOM Company. Dr David Waterhouse, Norwich Castle Museum, regarding casts made of Norwich rhino horns. 'It was a fantastic course and I really enjoyed it. Can’t wait to put some of the things into practice! I’ll let you know how I get on!' (Nick). 'Many thanks for a great course! I learned a huge amount and had fun too.' (Susi). 'It was an excellent course last week. Many thanks for all your hard work and for bearing with us through the teething troubles! Also, thank you for the images and the certificate… and for your message about the conservation forum. I’m very grateful for all of these.' (Subhadra). 'The course exceeded my expectations… we made a pretty good team! Thank you for making me feel at home.' (Catarina). Upon seeing the comments above on our Facebook page, 'Herefordshire Heritage Services' wrote "I did this course at the Horniman last December and it was brilliant!" Garston Phillips, Collections Officer, Worcestershire. ‘Just read your report. It is really clear, so much I didn't realise about the elephant skeletons! Thanks for the additional notes on the museum concerning the pest control and humidity/temperature recorder, this will help me loads.... Thanks also for the extensive report describing your work - this is really helpful! Again I would like to thank you very much for all your work this week’. Dr Celine Caquineau, School of Biomedical Science, University of Edinburgh. ‘Thank you very much for your kind attention, advices and information. I will try to get recomended bibliography. Is lucky to be related with professionals as you (not everyone shares what he knows ). A grateful greeting from Spain’. Paloma López Sebastián, Berriztapen Zerbitzua/Servicio de Restauración Arabako Foru Aldundia / Diputación Foral De Álava. 'I really enjoyed your course. It really fuelled an interest in me to further investigate the state of many of the wet specimen collections in Swedish museums’. Thank you so much for doing such a lovely job with the corals and other bits and pieces - it makes such a difference to us to have some help. Nigel, We are very grateful to you for being able to restore both giant deer skeletons so well and so quickly. I am sure you need a long rest! It is particularly pleasing to see the second giant deer skeleton on display as it is the first known skeleton of this species and has historical and scientific importance. Dr Andrew Kitchener, National Museums Scotland. Thank you once again for the professional, swift and efficient way in which you dismantled and removed the plesiosaur from our entrance hall. Dr Jeff Liston, Hunterian Museum, Glasgow. Thanks for all the work that you did. It is so lovely seeing the stacks of neat boxes in place of the awful old ones, and knowing that now we have a computer record of the geology that we can add to. Ros Allwood, North Hertfordshire Museums Service. I saw the restored cross for the first time this morning and was delighted with the finished result. Thank so much for you work. '...(Nigel) has cast specimens in resin for me and I must say his work has held up well and still enhance my sessions in spite of repeated handling! So I can personally and professionally recommend him to produce an accurate replica suited to your needs'. Dorcas Sanders, Museum resource Centre, North Hertfordshire District Council. 'I participated in Simon's fluid preservation course at the Horniman in November 2010 and I personally encourage everyone who is interested in fluid preserved collections--particularly those of you who work with old collections--to take this workshop if you can. Simon is a terrific instructor and the Horniman facilities are excellent. You will learn a lot of very useful things. A write-up about the course is due to appear in the upcoming SPNHC Newsletter'. John Simmons, Museologica, Pennsylvania, USA. 'Many thanks for this extra information, which along with the report on the collection hugely helps to answer all my key questions and is a real weight off my mind. Thank you also for the photocopies and advice on polypropylene trays'. Isla Gladstone, York Museums Trust. 'Thank you for restoring the whalebone arch so beautifully. It looks magnificent'. 'I've finally had a chance to look at the casts you've made for us; they really do look splendid - you've done a wonderful job'. (Regarding painted replicas of the Berlin Archaeopteyx fossil skeleton) Alison Hopper-Bishop, Royal Albert Memorial Museum & Art Gallery, Exter. Claire Thornton, Collections Manager, St Albans Museum Service. John Davies, Chief Curator at Norfolk Museums & Archaeology Service. Mrs Linda Curl, regarding work at Narborough Museum. Peter Crowther, Curator of Geology, Ulster Museum, National Museums of Northern Ireland. ‘I had a really good time on the course and the confidence it has given me is priceless.’ Lucie Graham (2010 Cambridge course). ‘Thank you very much for an excellent course. I really enjoyed it and gained a lot from it, and I felt it was well paced.’ Angela Smith (2010 Cambridge course). ‘Thank you so much for a very enjoyable and informative course.’ Siobhan, Mary, Claire and Phil. (Dublin, 2008). 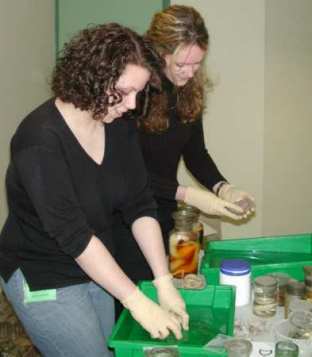 ‘Thanks for a fantastic course - really well balanced and glad we had time to make mistakes while you were there!’ Sophie Lenham, Colchester and Ipswich Museum Service, 2009.